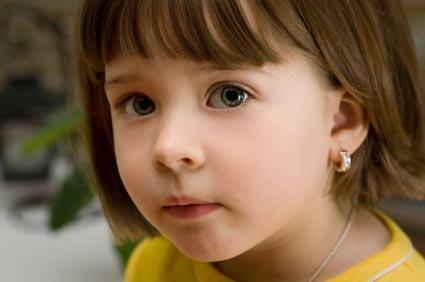 Clip on earrings are a good option for a child with non-pierced ears. They give a little girl the opportunity to wear earrings when she's not quite ready for the responsibility of pierced ears. There are many fashionable clip on choices from a variety of retailers to match moods, outfits, and personal tastes for every child. Pink Nature Stud Set: This set of earrings features pink enameled mushrooms, ladybugs, clovers and birds. Made from gold alloy, these earrings are considered child-friendly and safe. Each earring is about half an inch in width and height. Pick up the set for just over $30. Le Petite Princess Drop Earrings: This drop earring features a turquoise bead that's supported by an adorable gold-colored bow encrusted with mini ivory pearls. They retail for about $30. Princess offers two clip on styles for little girls. Each set is a great value with multiple colors of the design. Note that the clips are nickel-plated, so you'll want to avoid these if your child has a nickel allergy. Both sets retail for about $8. Daisy Flower: This set has seven pairs of earrings in white, pink, green yellow, aqua, persimmon and purple colors. The pretty daisy designs all have yellow centers except the pale yellow flowers, which have brown centers. Sunflower: This set features eight pairs of sunflower clip ons in white, melon, mint green, red, yellow, purple, aqua and persimmon colors. The flower centers are in shades of pink and yellow. 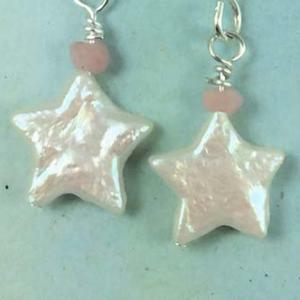 Pearl Stars: This dangling pair of earrings is adorable and would be a good fit for girls 8-10. The stars are made from fresh water pearls and dangle about an inch beneath a rose-colored bead and sterling silver finding. This pair costs around $50. It's Puppy Love: These sterling silver paw print earrings are cute for any dog lover! The paw prints are hollow to make them lightweight and easy to wear. The earrings are an inch long and about half an inch wide. Get this cute pair for just over $40. Gummy Bear Clip On Stud Set: These cute earrings look like gummy bears! You'll want to keep them away from kids young enough to try to eat them, of course. The bears come in shades of pink, blue, and purple with silver-plated findings. The set of three pairs retails for about $10. Round Zirconia Studs: These 5mm round cubic zirconia stud earrings have a gold-colored metal clip on back. The zirconia stone measure 1/4" in diameter and adds a bit of sparkle to any fancy outfit. Pick them up for under $10. Aligle Pretend Play Princess: This set offers four pairs of clip on earrings, perfect for when your child wants to play dress up. The set includes handmade heart-shaped clip ons with dangling beads in red, blue, pink and purple for about $10. Rainbow Toyfrog set: This very cute set includes seven pairs of earrings. Designs include strawberries, cherries, starfish, butterflies, lolly pops, bunnies, and flowers. Get them all for under $10. Fish Tank Earrings: Scroll down almost to the bottom of the page to discover these sweet clip ons that feature a fishbowl with a goldfish complete with bubbles. Get the pair for under $10. Pink Cupcakes: Pink icing over chocolate cupcakes with sprinkles! These earrings also feature a red heart on top. Perfect for a budding baker at under $15 for the pair. Clip on earrings are not as popular as pierced, but are an excellent choice for kids who love jewelry. If you prefer to shop in person, try local jewelry stores, boutiques, big box stores and children's clothing shops for additional great finds to fill your child's jewelry box.